There are various android reminder apps available in the market today and just as their name suggests, these app are used for reminding users of various pertinent appointments and events that they are scheduled to attend or participate in. Just remind is a simple comprehensive reminder app that is capable of bringing to the attention of the user various events, meetings, tasks and other such pertinent issues they might be required to attend to or undertake, whichever the case may be. The app allows the user to set specific times and dates that they will need to be reminded on various issues. Just remind, like many other reminder apps features various functionalities that are tailored to ensure that the user’s attention is drawn to an important aspect that they need to attend to. The app offers support for various specific reminders such as phone call reminders where the user is required to make a phone call to a specified individual or organization, birthday reminders in case you are required to attend or participate in a birthday ceremony, anniversary and bill reminders among others. One of the things that clearly stands out with respect to the just remind app is the speech-to-text support which implies that the user is not required to type a remainder. The app also features customizable repeat intervals whereby the user can set the reminder to repeatedly activate after a specified period of time which could be minutes hours, days, months or even years. In addition to the customizable repeat intervals, there are other customizable options that constitute part and parcel of this vital android app. One such option is custom image in which the user selects an appropriate image for the set remainder. Besides the images, the user also has the luxury to select an appropriate ring or alarm tone that corresponds to specific reminders. 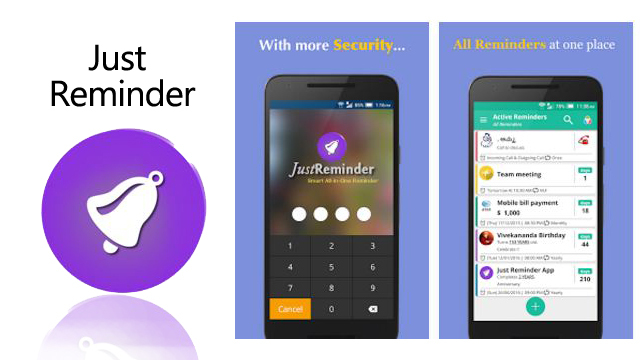 There are several aspects of the Just remind be app that indeed make it the ideal reminder app for android users. First and foremost, the app’s speech-text feature makes it convenient to use for all users and especially those who for one reason or the other, might not be in a position to type. Secondly, the various customization options available with the app implies that a user can program the app to suit their specific needs in terms of the images to use, the nature of remainder tones or even the repeat options. There are also other additional options such as the LED support that executes LED flash lights in conjunction with the reminder ensuring that you are never in a position to miss the signal. The availability of smart options also serve to enhance the overall user experience with options such as smart bill reminders that will bring to your attention outstanding bills till the day they will be paid. There are not many negative aspects of Just remind to write about perhaps the only major flaw is the fact that this app does not offer support for external ring tone or ring alarm sources. All in all, Just remind is indeed one of the most reliable, comprehensive and yet simple to use reminder app available in the market today. VCNC, a Korean app developing company, has recently launched an app for the iOS platform called Between’. The app, which is targeted at couples, intends to make communication and day to day interactions smoother among couples. 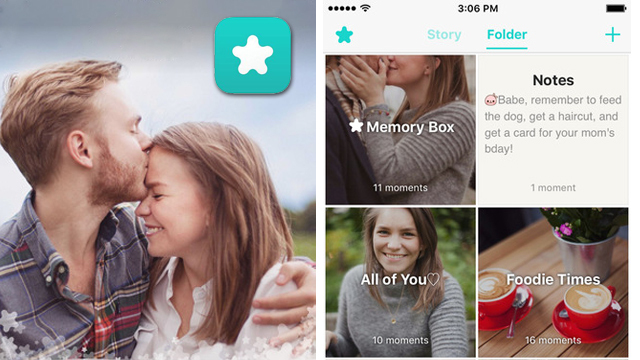 On first look, one would expect such an app to ensure you never forget your partner’s birthday or anniversary, and Between does just that. Along with a synchronized calendar, comes an IM(instant messaging) service, an easy photo share option, cute stickers for couples to share and notes, in both text and multimedia format. The key marketing line by VCNC for Between is that one can create their own space, just for two’. This makes the app different from other IM services in that it is exclusively mutual for you and your partner, eliminating distractions like groups and constant notification. But the uniqueness of the app, to me at least, seems dubitable. This is because it is almost equivalent to creating a group for just you and your partner on any other app that provides IM. Regardless, TechCrunch magazine claims that Between has raised $3 million and is fast expanding into Japan and the rest of the Asian market. This wide reach is reflected in the vast variety of languages the app is available in which includes English, Korean, Japanese and even Mandarin, among others. What remains to be seen is whether couples would actually take the effort to download a sizeable app(around 45 MB) that basically provides services similar to WhatsApp, with the only difference being mutual exclusivity to couples and a shared Calendar service. One thing Between would most definitely help with is planning events through the month on a synchronized calendar. Be it birthdays, football practice, yoga, grocery shopping or even her time of the month, keeping track becomes awfully simple with a synchronized calendar that comes with reminders and alerts. Between, which is now available on the Android platform via Play Store for free, claims a user base of over 13 million couples, which is an astounding number considering how recently the app was launched. Most of the user feedback is positive and supportive, with the biggest acknowledgement going out to the level of privacy the app provides due to its mutual exclusivity. But then again, to what extent Between is secure as compared to other IMs whose data leaks have been in the news time and again remains yet to be seen. The interface for iOS is smooth and comfortable to use with easy slide-in slide-out features for reminders and alerts. The design is simple and convenient and targets functionality over looks. The soft glow and rounded edges are typical of the Jobs era of Apple apps. The Android version, though is slightly more raw and while being perfectly good, lacks the smooth design that the iOS version provides. The biggest issue the app faces is size. At 45.5MB (37MB for Android), it is one of the heavier apps that eat up a lot of space. This is no issue on high end phones with high RAM and clock speeds but might be an issue in lower end cell phone models. All in all, Between breaks the mould and provides something completely different at a time when IM apps are all about including more people and making bigger groups. In a strange sense, Between does quite the opposite by letting you connect to just one other person, the one you value most, your loved one. In a world where the startling growth of population both offline and online is stifling individualism, Between is a highly individualistic app with individually customizable options. This makes Between a stellar renegade among today’s conventional apps.